I have seven daily tip accounts on Twitter. These accounts post once a day, Monday through Friday, plus occasional unscheduled posts. Please help new people find out about these accounts by linking to this post or by recommending your favorite account on Twitter. I’m going to do another giveaway like the one I did last April. I’ll draw a winner from the tweets that mention one of these accounts. The winner gets a choice of a T-shirt or coffee mug with one of the Twitter account logos. 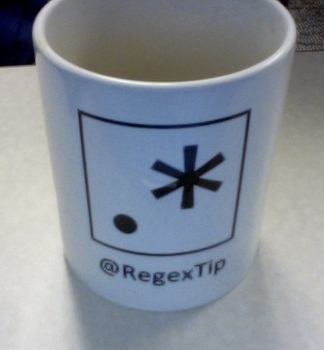 The winner from the Spring drawing chose a coffee mug with the RegexTip logo. Intentional or no, it is the hallmark of bad regexes. This tweet from AlgebraFact is wrong, I believe. “For square matrices of the same size A and B, Tr(AB) = Tr(A) Tr(B) where Tr = trace. For the NxN identity matrix I, Tr(I*I)=Tr(I)=N, but Tr(I)*Tr(I)=N^2. SteveBrooklineMA: Thanks for letting me know. You are right. That tweet certainly is incorrect. I don’t know now what I intended it to say. It’s true that Tr(A+B) = Tr(A)+Tr(B), though that’s not very interesting. I’ll delete that one.